Here is a story about the excitement and sadness of this hobby called being an Interurban electric railfan. It begins on a Sunday in April, 2002, when I was in North Kansas City having been invited there for a tour of the sites of the Excelsior Springs Division of the KCCC&StJ RY. No one was there. Not 20 minutes before the announced time, nor 20 minutes after. So, I took off on my own, as Debbie and I have figured out much of the right-of-way, and that weekend was possibly the last chance to get some good photography before the weeds and underbrush covered all, for another season. I met Charlie Winters of the Northland eight months previously in the summer of 2001. Charlie with his 50,000 negatives of trains and rail subjects is so famous nationally and in Kansas City I was reluctant to ever call him up, but I shouldn’t have been. He has been retired since 1993, and likes meeting people interested in the rails, I guess you’d say. One particular picture he had was of the “Avondale Trestle”, a structure that stretched 692 feet and carried the Interurban over a steam railroad line coming from Iowa called the Quincy, Omaha, and Kansas City RR (the O.K. Line) and of course, a small creek. The steel structure was torn down by the salvage company after the railroad went bankrupt, but what remained of the tall concrete footings the steel of the trestle stood on? These supports or pilings were really quite solid and impressive, pyramid-block like structures visible in Charlie’s pictures of the Avondale Trestle. A man standing near one of these would be dwarfed. In 1913 the railway cost of over $4 million dollars and was unique in the “Interurban Industry” as it was built to steam railroad specifications that included heavy rail and six steel structures varying in length from 1500 ft. to 139 ft. It had 108 reinforced “Luten-designed” concrete arches of various sizes. When I first learned about it in 1997, sixty-four years after its abandonment, so much of it remained simply because so much of it had been built. That Sunday in April 2002, I was driving down Antioch Road trying to find the spot Charlie said the 600 ft.-plus steel structure was, and Wow! Behind a suburban home built on the right-of -way of the steam locomotive line, was the south end concrete abutment of the “Avondale Trestle”. I knew in general where to look thanks to Charlie, but he was fuming about the missing concrete footings he said used to be on the other side of the road. I was really lucky because the gentleman who owns the house with this fifty-foot concrete barrier in his backyard was working in his driveway. Jerry Buchta dropped everything when I told him I interested in the Interurban. And while he talked about a small piece of rail he had found digging in his back yard, he didn’t mind my bringing out the video camera. “A friend of ours who’s in our Sunday school class is an engineer for the Kansas City Water Dept., in the drainage section, and said they have a project planned to remove the pilings from the creekbed as they inhibit the flow of water, especially after a heavy rain. You should see the debris backed up on the upstream side of those two we looked at. Enough to make any beaver proud. Oh, before I forget, the name of the creek is Rock Creek. It goes south, and I guess on into the Missouri River near Harrah’s Casino. Later into the summer of 2002 I received another letter from Jerry Buchta telling me he and his wife had taken a drive up through Clay County to see some of the Interurban sites we had discussed. Importantly, he learned the Kansas City Water Department had used up its funds for projects such as clearing out Rock Creek of the trestle pilings. For this fiscal year the ruins are safe, but the episode is instructive. The electric railway shut down operations March 10, 1933, and since that date its route through Buchanan, Platt and Clay counties has not been completely erased. In the 1930’s and 40’s a good number of impressive concrete bridges over the county roads were destroyed because farm equipment needed room for passage, otherwise the right-of-way was ignored. Even as late as the 1980’s Interurban Road’s 17 miles drive was a dusty, unimproved back road. In Clay County, the Interurban entered Excelsior Springs on its private right of way. An indication of its presence in the neighborhood of the Elms Resort is St. Joseph St. and Kansas City St. The depot in Excelsior Springs has been described as “gone, but still there nevertheless.” It is now part of the American Legion Hall located at the foot of the bluff below the Job Corps Center (former VA hospital). You can see the old grade as it comes toward the south and westward side of the building and also see some hand laid stone retaining wall similar to walls elsewhere on the line in Riverside, Mo. A few hundred yards from the “depot” the line contours downward past the west side of the Wabash Depot BBQ. The line ascends along St. Louis St. and when vegetation is not present a small Luten bridge is visible as the grade enters a fairly deep cut. Mosby, Missouri is next on the Clay County line, and incidentally from the east side of Liberty to Excelsior a substantial power line follows most of the line making it fairly easy to locate even when away from the roads. On the road to Mosby the top of a small Luten arced bridge is visible and all of a larger two arched bridge stands right along side the county roadway. At the southwestern edge of Mosby a long 3-areched Luten bridge carries the roadway one-way over the Fishing River. This bridge was the longest concrete structure when the RR was built, and support ties have been positioned by Clay County public works under one of the arches, which shows signs on stress. On Rush Creek in the Martha LaFite Nature Sanctuary east of Liberty, Mo. stands a magnificent, yet simple one arched concrete bridge, unique as it has a name carved in the crown: MC GOWEN. This Luten structure is not actually an arch, but is more accurately described as a semi-circle. Old footings for signals are visible in Martha LaFite as well as the still-standing electric sub-station near Clarksboro, off Highway H. Some abutment remains are where the Interurban crossed over steam lines near William Jewel College---now the CB&Q and the old Milwaukee/CRI&P/now IMRL mainline. The Liberty Depot stood for years at Mill and Leonard Streets, but was destroyed when the intersection was widened. Mill Street and Moss Street are on the Interurban right-of-way, as is a lengthy asphalt-paved walking trail at Canterbury Park. A large Luten culvert is on that trail, a smaller one is in the 200 block of Terrace Street, Liberty, a similar culvert is east of the Ford Plant in Claycomo. In Claycomo, Missouri, State Route 69 is partially built on the right-of-way, as are parts of Interstate 35, southward toward the Chouteau Trafficway exit. In this area are the abutments and pilings of the aforementioned “Avondale Trestle,” which was a steel structure--on Excelsior Street in Avondale is a perfectly preserved one-arched Luten concrete bridge. There the Interurban made its way through the small community to enter North Kansas City on Armour Street. At the corner of Armour and Swift Streets in downtown Kansas City, the St. Joseph division joined the Springs Route and the railroad proceeded to downtown Kansas City over the upper deck of the Armour Swift Burlington (ASB) Bridge. 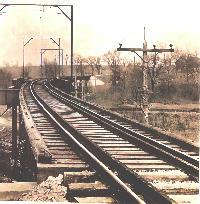 Prior to the beginning of construction on the Kansas City, Clay County and St. Joseph Railway in September 1911, the development syndicate which platted the town site of North Kansas City had built the ASB Bridge as a quick and easy connection to Kansas City proper. The lower deck was for steam road service and is still used today. The now abandoned upper deck was arranged for street and interurban cars, vehicles, and pedestrians. January 21, 1913, the first car was placed in operation on the Excelsior Springs division and the St. Joseph division of the road followed on May 5, 1913. Although the St. Joseph division was approximately two times the length of the former, the railway was until its end nicknamed "the Springs Route" or "the Clay County." Heading north on Swift Street the St. Joseph division ran alongside existing Route 9. It turned to cross Line Creek where a double-arched Luten design concrete bridge still stands almost hidden in the brush just blocks from busy Route 69. The route continued on Wakoumis Drive in Northmoor and Englebrook and at 68th Street Wakoumis turns but the actual roadbed of the Interurban proceeded in its northwest diagonal direction toward St. Joseph. This is the one section of the railroad bed that is still intact at this writing. At Berry Road a new condominium development called Barclay Club has in 2001 been built on the right-of-way and continuing development in this portion of Kansas City is fast erasing clues of the route. Jumping north to the community of Ferrelview near KCI Airport begins Platte County's Interurban Road. This 17-mile county roadway owes its name and existence to the railroad as after the system closure in 1933, Platte county farmers graded the route and made it usable from Ferrelview to Dearborn. The farmers needed passage over the Platte River on the bridge at Sharp's Station. Bill Chestnut was a young man in his teens when the railroad closed and has told the story about how automobiles and tractors would cross over the bridge, bumping along over the railroad ties "until the farmers themselves took up money and laid a deck." The county bought the bridge for $5000 from the sale of assets in 1933-4. North of Ferrelview some other portions of the road over creeks and streams are still one way. One particular concrete bridge stands over Todd Creek. Because Interurban Road curves before reaching the bridge the County Highway Department plans to build a two-lane replacement bridge to Federal Standards alongside it. The Todd Creek Bridge is one of the best of the Luten design concrete archways. Although perhaps not as romantic as the covered bridges of popular book and movie The Bridges of Madison County, the artistry and ingenuity of the Luten design Interurban bridges offer a lot more than just a way to cross to the other side. The Interurban builders turned these bridges into civic monuments that could just as easily be preserved than destroyed. From Dearborn to 11th Street in St. Joseph the route is possible to trace in those months of the year when vegetation is absent. The Chicago Great Western Railroad recently abandoned in the 1980's parallels the Interurban from Dearborn to Willowbrook and it was along this route in Buchanan County the steam train and electric cars would occasionally merge in scheduling and race at speeds as fast as traffic on today's Interstate 29.